As an odd sort of companion to Monty Python's final live performance, Monty Python Live (Mostly): One Down, Five to Go, the documentary Monty Python: The Meaning of Live was created to take a look at the behind-the-scenes of this production and try to capture what it was like for these men to come back together after so many years to bring back to life their old sketches from their television days. I suppose this makes sense when you take a moment to think about it. Having the Pythons come back for a reunion performance was quite the historic moment and why wouldn't a documentary film crew want to cover that? And as the show was a blatant effort to raise funds to deal with legal expenses, companion material like this documentary just play into the whole shindig to push all the hype possible. Capitalist cynicism aside, this was still a pretty fun piece and it just goes to show that there are so many fascinating facets to the Pythons that we'll probably never tire of efforts like these. 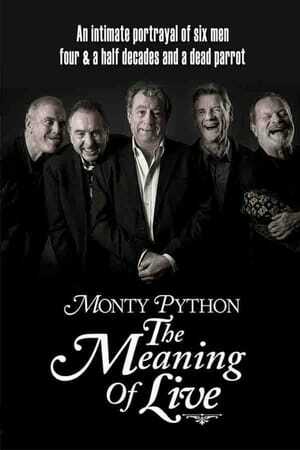 Synopsis: Monty Python: The Meaning of Live is 2014 British documentary directed by Roger Graef and James Rogan. The main focus of the documentary was the 10-day series of live performances by the Pythons at London's O2 stadium. As has been discussed many times, the documentary first goes into why the Pythons had to put together a new live show and all that fun stuff. But beyond the reasons, the documentary then takes you behind the scenes to see all the preparations that went into the show ranging from arranging new West End style musical numbers to act as transitions to figuring out all the blocking given they're no longer a full set of Pythons anymore. Beyond the 2014 reunion show, the documentary also discusses the history of Monty Python's past live performances and the varying opinions of the Pythons on those shows and the to some degree the whole Monty Python life as well. The whole thing is framed around the reunion show and how things went until that final curtain call. What I Liked: This documentary had a LOT of access to the backstage stuff and to the Pythons themselves and thus had a good mix of old and new footage and of course lots of interviews. And thus there are a lot of great moments that just happen to be captured on film that make the Monty Python fan that I am very, very happy. The best documentaries don't exercise too heavy a hand in terms of telling the storty of the subject. As much as every feature tries to have some sort of a slant, with a comedy group like this one you just have to keep the cameras rolling. Tying together the past live shows and going into a little detail on how those came together made for a great bonus to give the feature more meat. Had they only focused on the 2014 show I imagine this could have been a lot shorter. But the other material helped round things out and give us a richer watching experience. What Could Have Been Better: That said, this is still a documentary on a pretty narrow topic, and it's a made-for-TV documentary. So this is not some major art piece nor one that has more expansive coverage of the Pythons as a whole. It is a show focused on that live performance and some of their other live performances but not much else beyond that. This is definitely the sort of material that is great for existing fans but it won't win over anyone else really. It's a narrow topic that speaks to a specific audience and may not necessarily be a mass marker piece that has bigger scope in things. It's nice to see the Pythons laughing together and all that but if you don't know the show or you're not familiar with what had come before, then the payoff isn't all that great. TL;DR: Monty Python: The Meaning of Live is still a quirky little documentary that goes well with the live performance but perhaps not much else. It's definitely a strong fan piece and offers a few interesting insights that you may not have formed fro before. Thus the show gets a good 3.5 references to the departed Graha, Chapman out of a possible 5.